You have any eligibility left? The Associated Press reported that Fresno State (0-3) will be holding "open tryouts" to find a new placekicker_a development that moved the Bulldogs to No. 1 in the Bottom Ten. Actually, the team should also be auditioning prospective tackles, linebackers and defensive backs inasmuch as it's giving up 55.3 points per game. Why, even Steve Sarkisian's timid USC offense scored 52 against FSU, if you can imagine that. Elsewhere, the Big Ten leased all the space in No. 2, hanging on to its distinction as the most inept collection of football schools in the nation. The conference has a 1-10 record against the Power 5 conference teams. The BT's only win in that category was achieved by Rutgers over dreaded Washington State. **Worst 3-0 team in nation. Favored by a total of 53 points in first three games, the Ruins have eked out wins by a total of 18 points. Crummy Game of the Week: Idle. Rout of the Week: Texas A&M over the SMUs. Quotebook: Asked whether injured QB Brett Hundley would start the Bruins' next game, coach Jim Mora said: "I'm not going to tell anybody anything until kickoff versus Arizona State. Nobody. Nothing." Its not just that No. 1 Old Orleans lost its first two games. It's that in each defeat, the team blew leads with less than 10 seconds left to play. Looks like it's time for fans to to get out their old Aints shopping bags for headgear or buy new ones (paper sacks may cost 10 cents in some stores; the Bottom Ten does not share in most proceeds from sale of paper sacks). 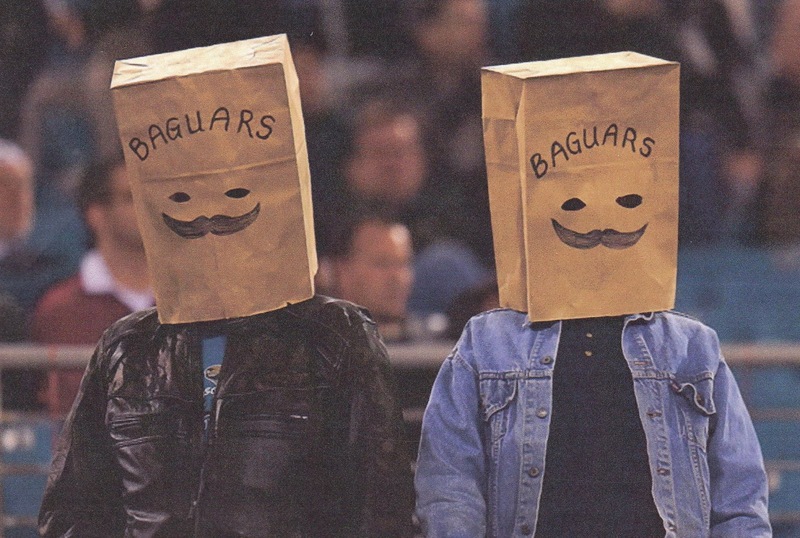 Too bad but Aints' fans probably won't be able to borrow the "Baguars" sacks donned by Jacksonville (0-2) followers (see photo below) since the Florida folks will be using them for their own team. It's also a candidate for the Bottom Ten title. Elsewhere, there's concern in Buffalo, which has WON its first two games, thus endangering its post-season BT prospects. Studies show that only 12% of teams opening 2-0 make it into the Bottom Ten tournament, tentatively scheduled for Flushing Meadows, N.Y., on April 1. Don't give up, Bills, you guys can still revert to your old, inept ways. 6. Grampa Bay (0-2); 7. N.J. Jets (1-1); 8. Kansas City (0-2); 9. Dallas (1-1); 10. Seattle (1-1). *Scores are approximations in some cases. Crummy Game of the week: Old Orleans vs. Minnehaha. Waiter, there's a football in my soup! The New York Daily News says that a Philadelphia waiter has received bids on eBay of as much as $100,000 for his copy of a $61.56 meal receipt signed by customer (and Philadelphia running back) LeSean McCoy. Angered over what he called "rude and disrespectful" service, McCoy left a 20-cent tip. Speaking of great stats...: No. 5 Oakland has failed to recover 19 straight onsides kicks by Sebastian Janikowski. Could be a placekicker tryout here, too.